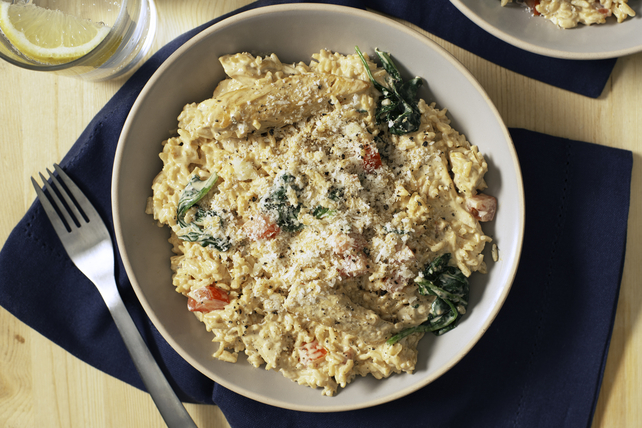 We love that this dish uses no cream but still tastes delightfully creamy. Heat dressing in large deep skillet or Dutch oven on medium-high heat. Add chicken; cook 5 min., stirring frequently. Stir in broth; bring to boil. Add rice; stir. Return to boil. Cover; simmer on medium heat 5 min. Add cream cheese spread; cook, uncovered, 5 min. or until completely melted, stirring occasionally. Add spinach (skillet will be full); cover. Cook 2 min. or until spinach is wilted; stir gently. Remove from heat. Let stand, covered, 5 min. Stir in tomatoes; sprinkle with Parmesan. Purchase bagged pre-washed fresh baby spinach in your produce section. Prepare using Kraft Calorie-Wise Zesty Italian Dressing. Whip up this one-skillet dinner for a simple, but elegant, meal that provides an excellent source of both vitamin A and C from the spinach. Eating right never tasted so good!